Did you know that President Barack Obama authored a children’s book? 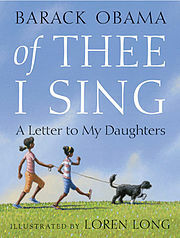 Titled Of Thee I Sing: A Letter to My Daughters, the book is “a moving tribute to thirteen groundbreaking Americans and the ideals that have shaped our nation.” Featuring beautiful illustrations by Loren Long, Of Thee I Sing reminds us that unity and diversity can and do coexist, and that the best qualities to be found in each one of us are also the best qualities to be found in the American people. When it came to Presidents Washington and Lincoln, the students were more familiar with the former American presidents, although ideas about “Honest Abe” who never told a lie still abound. Martin Luther King, Jr. is another name the children knew well, too. In our school, MLK receives a lot of focus; there is a great respect for this American, his ideals, and the civil rights he worked to achieve. 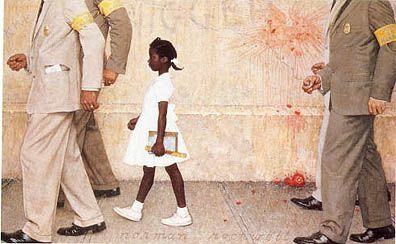 Another courageous American who is not represented in Of Thee I Sing: A Letter to My Daughters but that the students learned about is Ruby Bridges, the first African-American child to attend an all-white school in the South. The fortitude that Ruby possessed as she walked daily through an angry white crowd to attend school inspired and provoked lots of questions from our students. Ruby’s first grade experience was very different from that of our first graders today. Our children were curious to learn more. I have to admit, as I listen to the stories of Ruby Bridges and other great Americans, like the children, I too am inspired. I, too, am full of questions and am just as eager to make connections. The very best of who we are as a nation can be found in the strength of character of the people who strive to overcome great challenge and to make the world a better place.